Saphan Han is an old Chinese trading community, one of the many Chinese legacies, at the end of Yaowarat Road near the Rob Krung canal, where Chinatown Bangkok meets Pahurat Little India. The Rob Krung canal, the second canal ring around the old city, was dug in 1785 in the reign of King Rama I. Rob Krung, literally meaning "around the city", completely encloses the landward side of the old city on the east. With the Chao Phraya on the west, the city was virtually an island surrounded by a moat. 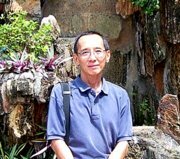 The Chinese who were living at the site where the Grand Palace was to be built were resettled outside the old city, just beyond the Rob Krung canal. Saphan Han got its name from the numerous swing bridges across the Rob Krung to allow access to the old city and for boats passing along the canal. The area was a landing point for the early Chinese immigrants who arrived after a long journey by ship from China. They made their way to settle in Soi Sampheng from which Chinatown grew. As the community expanded, others chose to settle near the canal and started this community. After fleeing floods and famine in the home country, the Chinese immigrants avoided farming and switched to trade and commerce in their new homes. 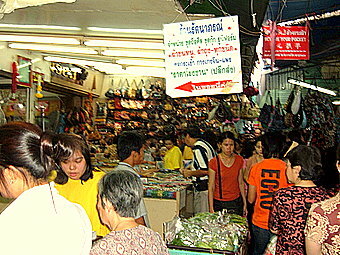 The result is evident from the many bustling markets in Chinatown Bangkok. Yaowarat Road, the main street in Chinatown Bangkok, has often been likened to a huge dragon rearing its head at the Odeon Gate, the entrance to Chinatown with its tail trailing at Saphan Han 1.5 km away. The main street is a quaint mix of old and new; "kao luck" (roasted chestnuts) and "bak kua" (barbecued pork slices) stalls, sharks' fins and birds' nest restaurants, Chinese medicine and goldsmith shops, old temples, hotels, 7 Eleven, Watson and Tesco Lotus stores. It's unmistakably Chinatown with signboards in Chinese and Thai script written in Chinese font, phone booths with a pagoda roofs and crowded markets squeezed into little lanes. 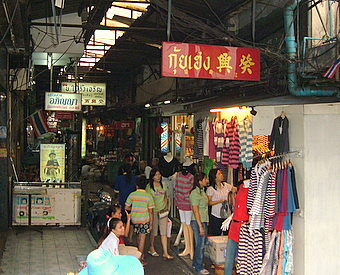 The Saphan Han market is one of them. Straddling both banks of the Rob Krung canal, this market is in a labyrinth of alleys crammed with stalls selling food, clothing, ladies lingerie, fabrics, and spools of thread, food, gold and watches. 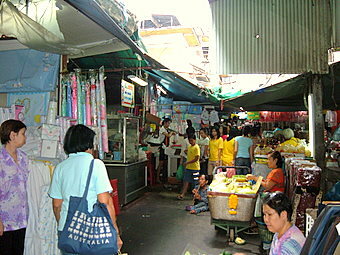 The market consists of a grid of five alleys parallel to the canal and another two across the canal over concrete bridges. The roofs of these shops virtually block up the view of the canal. You won't even notice the canal if not for the sign "Rob Krung" on the concrete traffic bridge. 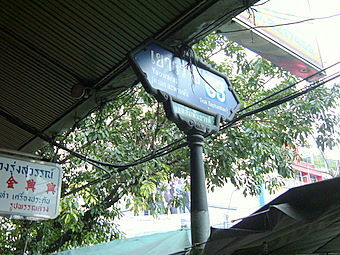 The official entrance appears to be the first alley on the Yaowarat bank with a sign showing Yaowarat Soi 33, Trok (alley) Saphan Han. The alley, with a glass roof high above and flanked by dark shuttered three story buildings, looks dim and deceptively quiet on a Sunday. Further in, the scene changes drastically to a busy local bazaar, with people browsing, haggling as they moved along the narrow passages. With makeshift roofs and canvas sheets overhead, it's hot and humid. Even a sudden shower doesn't deter the Sunday shoppers as they weave through carefully avoiding the rain dripping through the gaps. Wandering through this maze, I find a dingy alley with large trays of onions and garlic and huge pots brewing over charcoal fires just by the canal banks. Could this be the central kitchen for the food vendors in the next alley? An interconnecting alley leads to the part of the market that extends to the other bank of the canal where there's a food alley with vendors lining one side and tables the other. A small food court further in hardly leaves any room to pass. Thai Sikhs are among the crowd in this congested alley. After another turn, I emerge from the other end of the market to face Pahurat Little India. It's like entering a cavern from one end to emerge into another world at the other end. 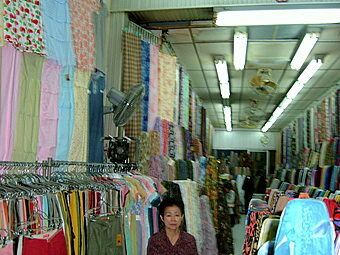 Saphan Han is Chinatown's answer the Pahurat textile market in Little India across the Rob Krung canal. It's like a bridge linking the two communities in more ways than one. The visitor gets a glimpse of the local markets and the essence of real life in a city less the cosmetic glitter commonly seen in downtown Bangkok. This side of Chinatown Bangkok at the dragon's tail seems to resist the new a little better in spite of the new developments around. Saphan Han still looks very much like what it was, doing what it has always been doing for the past century or more. 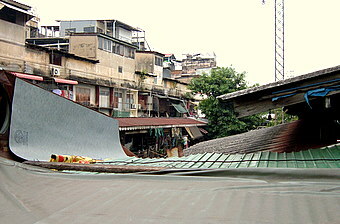 The Rob Krung canal passes under the market but you can hardly notice it as it is almost obscured by the market. 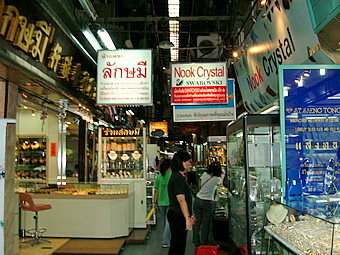 You can locate one of the entrances to Saphan Han at Yaowarat Soi 33. Yaowarat Road and the other roads in Chinatown Bangkok are heavy with traffic all day long and in the evenings. The best way to get there is to take the Bangkok subway to the terminal station at Hua Lam Pong and walk along Yaowarat Road till you get to Yaowarat Soi 33 which is before the bridge across the Rob Krung canal. You can also take a Chao Phraya river boat to the Ratchawong pier and walk along Ratchawong Road, turn left at Yaowarat Raod and continue walking till you get to Saphan Han. For more on Chinatown Bangkok.